Scientists have developed a method of directly measuring rock strength beneath the seafloor by using drilling performance parameters. Their new measurement method has found that the shallow accretionary prism in the Nankai Trough (figure 1) has been strengthened by horizontal compression due to plate subduction. This study project was led by Dr. Yohei Hamada at the Fault Mechanics Research Group of the Japan Agency for Marine Earth Science and Technology (JAMSTEC: President; Asahiko Taira). The depth-continuous in situ rock strength is a critical parameter for numerous studies in earth science particularly for seismology and tectonics at plate convergence zones. To measure rock strength below the seafloor, laboratory experiments have been common. However, due to limited amounts of rock samples and uncertain conditions below seafloor such as pressure and temperature, the depth profile of the rock strength has not been able to determine. 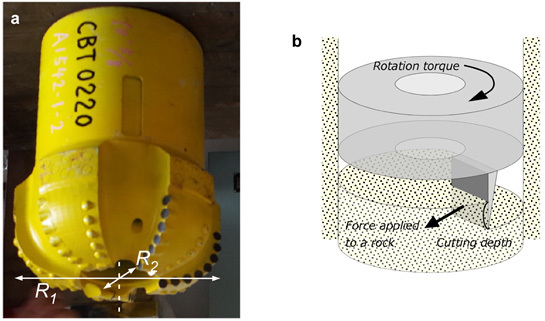 To identify continuous rock strength, the team has focused on performance of a drill-bit model (figure 2) such as drill string rotational torque, bit depth, and string rotational speed. Using data recorded during drilling operations of the Nankai Trough Seismogenic Zone Experiment (NanTro SEIZE)*1 by the deep water drilling vessel, Chikyu, they constructed a conversion equation from the parameter into the strength. 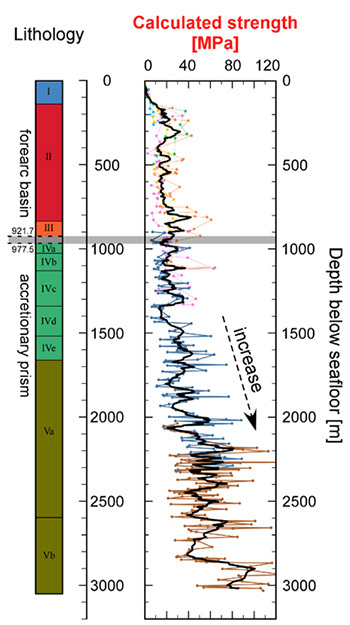 Their results have identified gradual increase in the strength from 1,500 meter-below-seafloor (mbsf), while no significant strengthening is found at the major lithology boundary between the forearc basin sediments and the accretionary prism. From that depth to the deepest part of a hole at 3,000 mbsf, the drilling-parameter*2-based measurement has indicated that the rock strength has been larger than expected from the pressure condition. 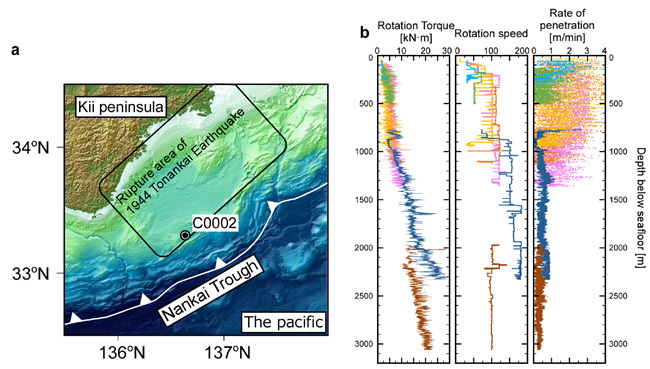 It suggests that sediments above the megathrust zone, which caused the 1944 Tonankai Earthquake, have been strengthened by horizontal compression due to the plate conversion. This new method offers significant advantages in measurement of rock strength below seafloor even when core samples are not available as it is highly practical for non-core or technically challenging drilling projects at hydrothermal areas and future mantle exploration. Though further study including laboratorial drilling experiments is necessary for higher accuracy of the conversion method, it is expected to help identify how strong the rocks are and how the elastic strain energy accumulates around the plate boundary fault. The above results were published in the Scientific Reports on February 14, 2018 (JST). *1 The Nankai Trough Seismogenic Zone Experiment (NanTroSEIZE) is a complex ocean drilling project that has been conducted over several years with multiple expedition teams of scientists from all around the world. The NanTroSEIZE attempts for the first time to drill, sample, and instrument the earthquake-causing, or seismogenic portion of Earth’s crust, where violent, large-scale earthquakes have occurred repeatedly throughout history.an ocean drilling project. *2 Drilling parameter records drilling information such as rotation torque, rotation speed per minute and weight on bit. The data is used for evaluation of drilling. Figure 1. a) Regional map of the NanTroSEIZE drilling transect and location of the site indicated as C0002, where this study’s drilling parameter-based measurement was carried out. b) Basic drilling parameters recorded at the site, C0002. Each color indicates the hole from which the data were obtained. a) Photograph of a drill bit of the same type used for drillings at the site. The bit type is polycrystalline diamond compact and the outer diameter is 10-5/8 inch. b) Simplified force-balance model at the bit tip. The complex actual surface shape of the drill bit was converted into one work face. Such simplification allows the surface-recorded drilling parameters, which can be applied to calculate rock strength. Figure 3. Depth profiles of lithology and rock strength evaluated by this research. Up to the depth of 1,500m, the strength level remains almost the same. Even at the depth of 950m, where the large geological boundary between forearc basin and accretionary prism exists, the strength is constant. The rock strength gradually increases at the depth of 1,500m and then stays at the same level after the depth of 2,200m.